Martin Mundie, 23, from St Fergus, Aberdeenshire, was employed by Joseph Adams and was part of a team carrying out work at Muirden Farm, Turriff, Aberdeenshire, to convert a former pig shed into a workshop. On 10 March 2009, Mr Mundie and three other workers climbed a ladder onto the roof to begin replacing the sheets and capping. A short time into the work, there was a loud crack and one of Mr Mundie's colleagues turned around to see him disappearing through a skylight. He fell approximately eight metres to the concrete floor below. He sustained a broken arm and wrist, and needed a bone graft as well as two operations to insert three plates and six pins. He was off work for ten months and still has continuing pain in his arm with numbness and limited movement, as well as the scars left by his operations. He no longer works for Joseph Adams. An investigation by the Health and Safety Executive (HSE) found that at no time before work started, or while it was ongoing, had Joseph Adams assessed any of the risks involved or put a safe system of work in place. HSE inspectors also found that none of the workers had any safety provision while on the roof. At Banff Sheriff Court today Joseph Adams of Backhill Farm, Mintlaw, Aberdeenshire was fined £4,500 after pleading guilty at an earlier hearing to breaching Section 2 of the Health and Safety at Work etc Act 1974. "Mr Mundie has been left with significant and lasting injuries that could easily have been avoided if Joseph Adams had thought about the obvious risks involved when working on the roof. "Joseph Adams did not provide any equipment to allow the men to work on the roof safely. He could have arranged for his employees to work from a mobile elevated work platform, wear safety harnesses while they were on the roof or for properly fixed crawling boards with barriers to be used. Not providing any of these safeguards is simply unacceptable. "Guidance is freely available on the HSE website to help dutyholders ensure that work at height is carried out safely. If Joseph Adams had taken simple safety measures, Mr Mundie would not have sustained these injuries." Falls from height are the most common cause of fatal injuries in the workplace. 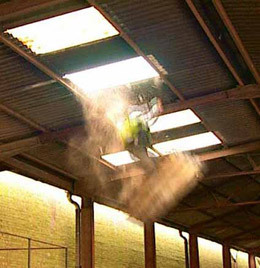 In 2009/10, 38 people in Britain died after work-related falls from height.